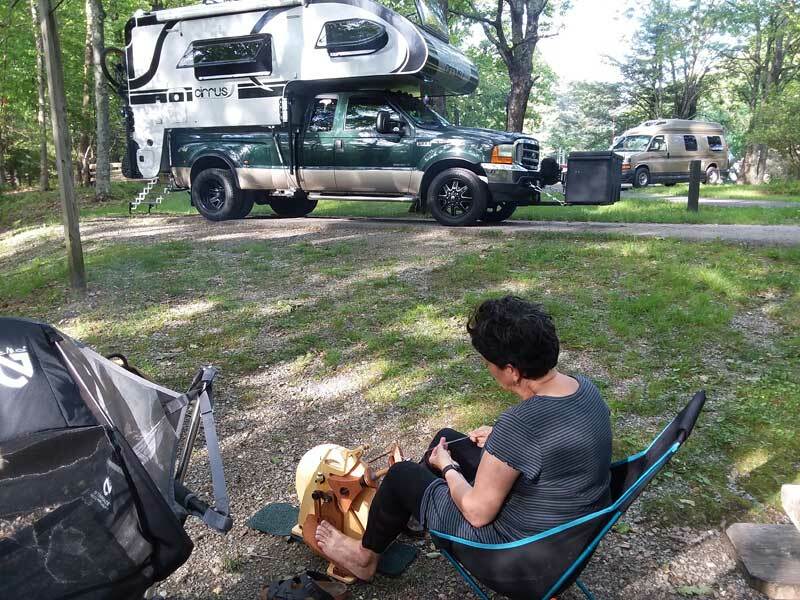 We had a blast reading about all the fun things folks do in their truck campers when the sun goes down. What’s particularly fun is both the incredible variety of things fellow truck campers do, and the unexpected trends. Evidently there are some seriously competitive games of Scrabble, Yahtzee, and Cribbage throwing down in cabovers across the land. And not everyone goes to bed happy. The responses are well worth the read to get ideas for your next truck camping trip. No matter where you go, night will fall. Here are about 100 ideas to keep the truck camping party going, long into the night. “Most times after dark we are by a campfire till 9:00 or 10:00pm. It is usually quiet and peaceful. The campfire is just memorizing. Above: This video is one of Vince’s accordion buddies from Seattle. “I’m an accomplished accordion (and button box) player. Sometimes I bring an accordion along. I play music from Germany, Austria, Ireland/Scotland, France, Italy, etc. It’s like taking a trip to Europe – only cheaper (but not by much). Accordions are loud, so I usually play when the windows can be mostly closed if we have close neighbors. Most people don’t understand this kind of music anymore. “If we’re not sitting around a campfire, we usually take an after dark hike and head back to the camper for a movie. We hardly ever watch a movie at home, but really enjoy making a nest in the cabover to watch a movie. We love our camper! “I shoot video all day in support of our YouTube channel. I usually shoot between 8 and 16 GB everyday spread between six cameras. I try to make a video documenting each day. At the end of each day I have to create a folder and download that day’s footage in order to properly and accurately store many Gigabytes of data. I then charge all the batteries. Yoly enters all the expense receipts for the day and keeps her financial accounts updated. Then, she plays video games on her laptop. We have a PS4 with us to watch Bluray movies (from our own large collection). I also play racing video games religiously.